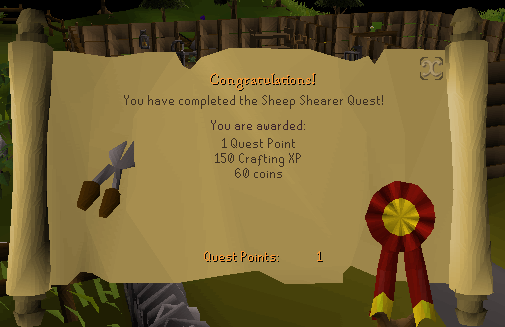 The Sheep Shearer quest is a great one to start with if you are new to the game. 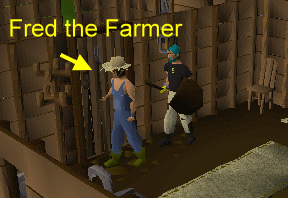 This Runescape quest guide is the first of several to be covered here in detail. Once you've finished these quests I'm sure you'll want to do more and if you get stuck Killer Guides has put together the most comprehensive Runescape Quest Guide List around with Some pages of information. To be able to complete this quest without too much running around, make sure you have 21 free inventory slots before you start, otherwise you’re going to have to do parts of the quest in two or more batches depending on how much room you have in your inventory. 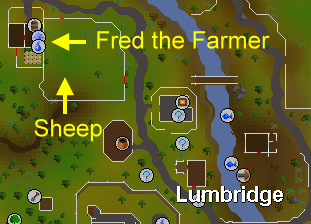 From Lumbridge, head north along the road until you see a small chicken farm on your left. I’ve indicated the position on the map below. Before you leave the building, check the table against the wall. There are shears on there that you can pick up so you don’t need to buy them. You get to keep these after the quest is finished which is quite handy. Once you’ve picked up the shears head out of the building and head back down the road. The sheep pen is right next to the building but you need to go a little ways back down the road to find the gate to get in. Now the fun starts! Your mission is to run after the sheep trying to shear them but they’ll run away from you. Make sure you are running and not walking as that makes it much easier to chase the buggers down! I found that I could make them into a corner sometimes. 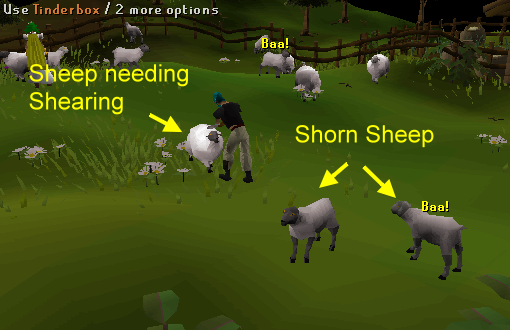 In the picture below you can see that there are two types of sheep in the field. The big fat fluffy ones are the ones that need shearing and the skinny looking ones have already been done. 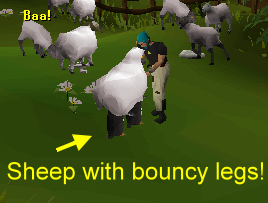 Also check what you click on because if you accidentally click on a Ram you’ll attack him instead of shearing! They are only level 2 but they just take ages to kill and don’t drop anything useful so it’s just a waste of time. One last thing... some of those sheep have special bouncy legs and they spring up in the air to get away from you. Highly amusing :-) And don't bother chasing those ones because you won't catch them! Run back up the road to the farm and give Fred your balls of wool to complete the quest. Note that if you did not have enough room in your inventory for all 20 at once you can turn them in to Fred in batches. That’s it, quest complete!